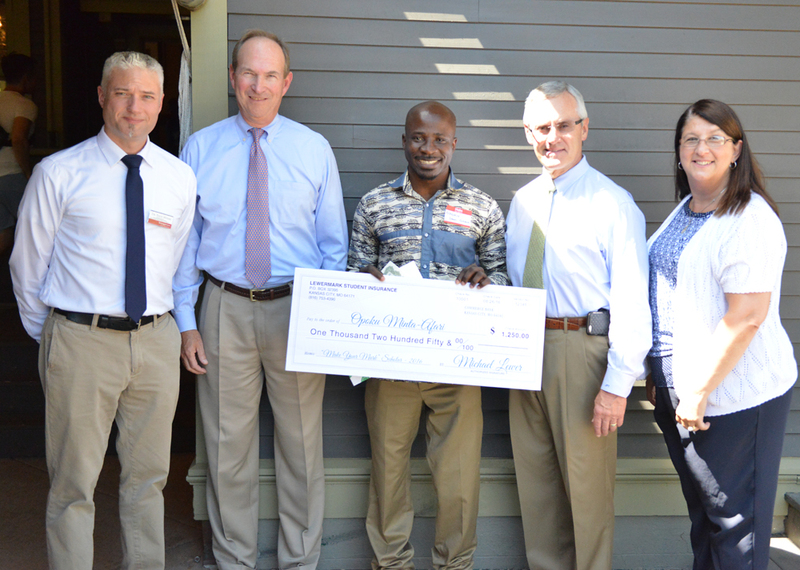 YSU graduate student Opoku Minta-Afari, center, was presented the 2016 LewerMark “Make Your Mark” scholarship at an event at the Pollock House on campus. Also pictured, from the left, are Nate Myers, YSU associate provost for International and Global Initiatives; Jeff Crawford, vice president of LewerMark Student Insurance; Minta-Afari; YSU President Jim Tressel; and Desa Pavlichich, administrative assistant, YSU Center for International Studies and Programs. Youngstown State University graduate student Opoku Minta-Afari, a mathematics major from the Volta Region of Ghana, recently took first place in the 2016 LewerMark “Make Your Mark” scholarship contest. Minta-Afari’s scholarship is valued at $1,250. This scholarship was awarded last month during the International Coffee Hour at Pollock House on the YSU campus. Jeff Crawford, vice president of LewerMark Student Insurance, was on hand to make the presentation. In his winning essay, Minta-Afari, now the organizing secretary for the YSU African Students Union, discussed the hardships he faced in early life, such as his bout with polio when he was only three years old, which resulted in paralysis of his left leg. “I overcame various financial and health related challenges to obtain an honorary degree in Actuarial Science in 2010 and worked as an actuarial analyst with a consultancy firm in Ghana,” Minta-Afari wrote. He said he wishes to become a health actuary, aiding families with low incomes to receive healthcare. As an undergraduate, Minta-Afari was president of the Physically Challenged Students Association at the Kwame Nkrumah University of Science and Technology. “This office is now a one stop point for students who have any form of disability to document their disability and also seek help from the school administration in support of their education,” he wrote. This past spring, the African Students Union donated 100 hours of its time tutoring high school students and mentoring others in observance of the 2016 Volunteer Week.